Many of our readers know Peggy Bendroth as the Executive Director of the Congregational Library, but some of you also know her as Dr. Margaret Lamberts Bendroth, esteemed religious historian and author. She is featured in this month's installment of the Four Questions interview series on the Religion in American History blog. The historian Peggy Bendroth is the executive director of the Congregational Library in Boston, MA. Since her first book appeared 20 years ago, she has shaped the field of American religious history in profound ways. Her insightful work on gender, childhood and family, and the cultures of fundamentalism is as familiar to the grad student as it is to the established professor. Among other things Bendroth has explored the day to day lives of believers and helped us understand how men and women, young and old, came to terms with the tumultuous 20th century. 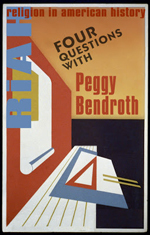 If you'd like to learn more about Peggy's educational path, research techniques, and upcoming projects, go read her answers to Randall Stephens's four questions.